Plantain is sliced into thin circles and fried in oil till cooked. They are then added to jaggery mixture and cooked briefly. Serve sweet plantain curry with steamed rice and dollop of ghee. Remove ends, remove thick skin and slice plantain into thin circles. Soak tamarind in few tablespoons of hot water for sometime and extract all the thick juice discarding any veins. Heat oil in a pan, add plantain slices. Fry on medium flame till plantain slices are cooked and start to turn golden brown. Once plantain slices are fried, remove from pan. Heat oil in a pan, add all talimpu ingredients in order. When mustard seeds start spluttering, add green chiles. Fry briefly and stir in tamarind extract, mashed jaggery, turmeric powder and salt. Let the jaggery melt completely and the mixture come together, stir in plantain slices and cook for few minutes or until the syrup coats the plantain slices well. 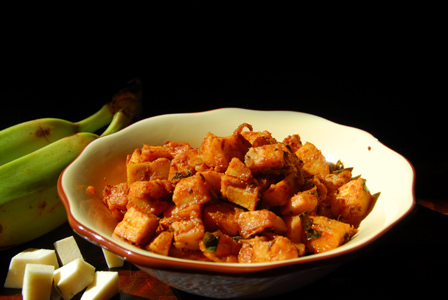 Serve sweet plantain curry with plain steamed rice and dollop of ghee. Notes:Make sure plantain pieces are cooked well before adding to the jaggery mixture. Suggestions: If plantain pieces are not soft, add few tbsps of water into the curry and cook covered on low flame till done. Variations: Plantain with Green Chana, Chilli Plantain. Other Names: Teepi Aratikaya, Sweet Plantain Curry. Plantain / Raw banana is sliced after its outer thick skin is removed. 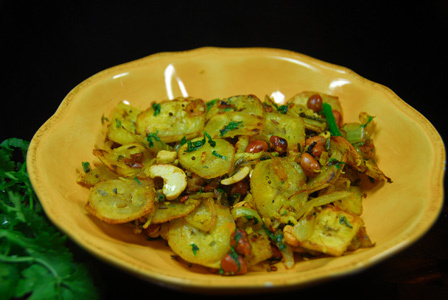 The plantain slices are fried in oil separately and cooked with onion and spice powders. Serve plantain onion fry with steamed rice and dollop of ghee. Makes: around 4 Servings of Plantain Onion Fry. Remove thick skin and thinly slice the green plantains. Removes stems, wash and slice the green chiles. Wash and finely chop the cilantro leaves. Heat a tbsp oil in a pan, add plantain slices and fry till they turn golden brown around the edges. Remove the plantain slices from the pan. Add a tsp of oil in a pan, add all talimpu ingredients in order. When mustard seeds start spluttering, add ginger garlic paste. Fry briefly, add green chiles and sliced onion. Fry till onion turns translucent and start to change color. Stir in plantain slices, coconut, turmeric powder, cashews, peanuts and salt. Cook for around 2 minutes and stir in cilantro. Remove from heat and sprinkle chaaat masala powder and stir in lemon juice. Serve plantain onion fry with steamed rice and dollop of ghee. Notes: Make sure plantain is cooked well. Suggestions: Make sure to reduce the salt if chaat masala has salt in it. Variations: Check other plantain recipes here. Other Names: Plantain Onion Fry, Aratikaya Ullipaya Vepudu. Plantain is cooked with skin till soft. It is then mashed up and mixed with rice flour and spices into soft dough. Dough is then made into small thin discs. The plantain vada is then deep fried in oil till its golden brown in color. Serve plantain vada with steamed rice and dollop of ghee. 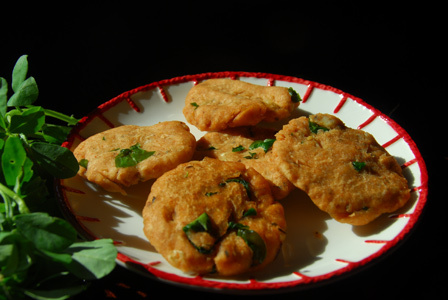 Makes: around 7 Plantain Vada. Wash and cut the plantain in half horizontally. Pressure cook the plantain in enough water for 2 whistles. Alternatively, boil the plantain in a sauce pot with water till its soft. Cool the plantain till its warm enough to handle, peel and remove the from onto a bowl. Mash the cooked plantain with help of a fork into paste. Wash, separate leaves and strain the fenugreek leaves. In a mixing bowl, mix together mashed plantain, rice flour, fenugreek leaves, red chili powder, cumin seeds and salt into soft dough using little water. Taste and adjust the spices if necessary. Take lemon sized plantain mixture and form into a soft ball. Press the ball with wet fingers to flatten into thin disk and place it aside. Repeat the same with remaining plantain dough. When oil gets hot, carefully drop the plantain vada into oil. Fry the plantain vada on both sides till golden brown in color. Remove the deep fried vada onto absorbent paper. Serve plantain vada with steamed rice and dollop of ghee. Notes: Make sure plantain is cooked well before peeling. Suggestions: Don’t leave the cooked plantain outside for a long time. Leaving outside might harden the cooked plantain. Once cooked, peel and mash as quickly as possible. Adjust rice flour depending on the wetness of the plantain mixture. If plantain vada not cooked well, put it back in oil and fry on medium low flame till done. Variations: Check other recipes with plantain here. Other Names: Plantain Vada, Aratikaya Vada. Onion is roughly chopped and pulsed into coarse mixture. Raw banana / plantain is chopped and pressure cooked along with coarsely ground onion mixture and tamarind extract. 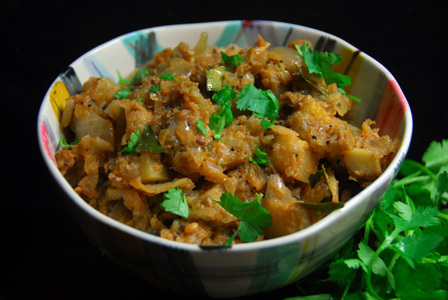 Serve raw banana onion curry over steamed rice or with roti. Makes: around 4 Servings of Raw Banana Onion Curry. Soak tamarind in few tablespoons of hot water and extract all the juice discarding any veins. Wash, remove ends, peel and chop the raw banana into small pieces. Peel, wash and roughly chop the onion. Coarsely grind the onion using a blender. Wash and finely chop the cilantro. In a vessel, add the ground onion, chopped raw banana, tamarind extract, ginger garlic paste, red chili powder and salt. Pressure cook the above mixture for 2 whistles and let the cook stand for couple of minutes before removing the contents. When mustard seeds start spluttering, add cooked raw banana mixture. Fry for few minutes or until any raw smell is gone. Serve raw banana onion curry over steamed rice or with roti. Notes: Make sure raw banana is cooked well. Suggestions: If raw banana or onion is not cooked well, put the pan back on heat and cook covered on low flame till done. Adjust spice with red chili powder. Variations: You can also grind red chiles along with onion and not use red chili powder. Other Names: Raw Banana Onion Curry. Plantain is peeled and chopped into small pieces. Chopped plantain is fried till it turns brown. Tomato is chopped up and added to the pan along with spices. Serve plantain tomato curry with steamed rice and dollop of ghee. Remove ends, remove the thick skin and chop the plantain into small pieces. Soak tamarind in water for few seconds and extract all the juice. When mustard seeds start spluttering, add chopped plantain. Fry till plantain cooks and start to brown. Add tomato in the middle of the pan, add tamarind extract and salt. Cook till tomato is soft, stir in garam masala powder and red chili powder. Fry for a minute, stir in chopped cilantro and remove from heat. 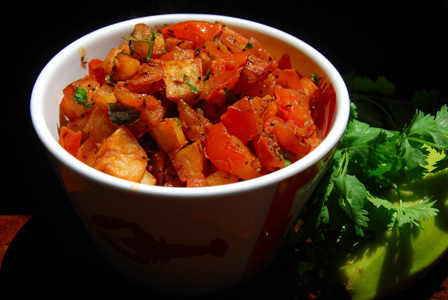 Serve plantain tomato curry with steamed rice or with roti. Notes: Make sure plantain is cooked well before removing from heat. Suggestions: If plantain is not cooked well, put it back on heat, add a tsp of oil and fry till done or cook covered till done. Other Names: Plantain Tomato Curry.